I love anything sweet… cookies, chocolates, cakes…. yummm. Cakes in particular are my favorite, nothing can beat the smell of a freshly baking cake in the oven. 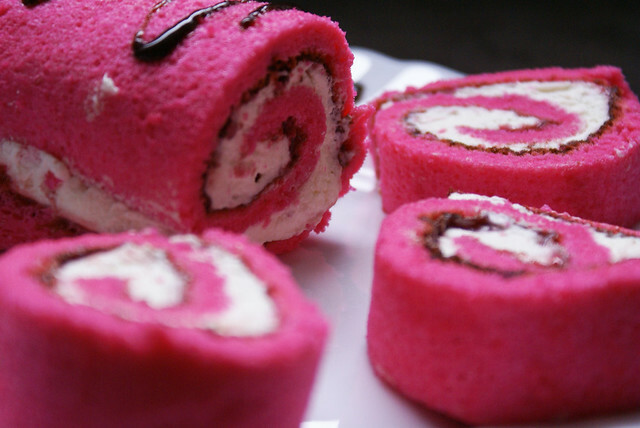 And talking about cakes, I always had a fascination towards Swiss rolls. 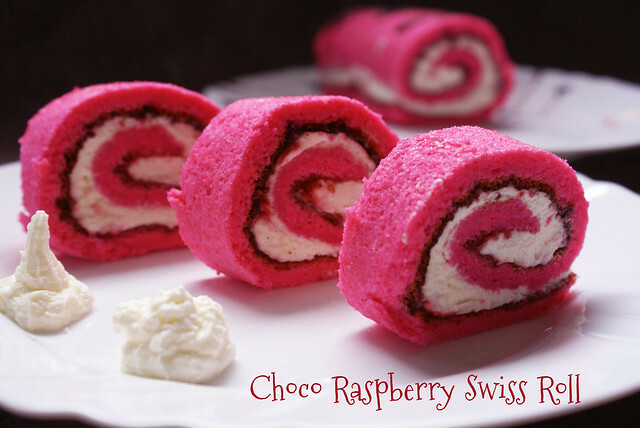 After I started Baking, I never tried to experiment with Swiss Roll, because I thought its a very complicated process.But despite the appearance, Swiss Rolls are in fact very easy to make. It was easy than the Pineapple Pastry I made sometime back. And Swiss Rolls are not from Switzerland. According to wikipedia, they originated somewhere in Central Europe. Its a traditional German, Hungarian and Austrian type of Cake. And in Germany they call it Biskuitrolle or Roulade. Grease a 40X30 cm Baking pan and line it with a butter paper, and then butter and flour the paper. Keep aside. Separate two eggs, placing yolks in one bowl and whites in one bowl. Add 1/2 cup sugar to the yolks and the whole eggs(in Step 4), and beat on high speed till thick, pale and fluffy. Add vanilla essence and color(if using) and beat again for 1 min. Sift half the flour mixture into the egg mixture and fold gently till well mixed. Then add the remaining flour to the batter and fold in. Beat the egg whites (in Step 3) on medium speed till it forms soft peaks. Sprinkle in the remaining one tablespoon sugar and beat until stiff peaks form. Fold in the whites in to the batter (in Step 8) in two batches. Pour the batter in to the prepared pan, spread evenly with a spatula. Tap the pan lightly on the kitchen platform to remove any air bubbles. Bake for about 6 to 7 minutes, or till the surface is golden brown. Immediately upon removing the cake from the oven sprinkle with confectioners sugar and then invert the cake onto a clean Kitchen towel. Remove the parchment paper, sprinkle with confectioners sugar. Roll up the cake, starting from the shorter side, along with the towel. Place on a wire rack to cool. Place the raspberries and sugar in a small saucepan and cook over medium-low heat for about 8 minutes. Stir constantly to prevent burning. Remove from heat when the jam has thickened (it will thicken further when cool). Stir in the chocolate chips, mix well to combine with the jam. Set aside to cool. Spread a layer of whipped cream on the sponge. Pipe lines of raspberry jam on the cream. Wrap it in the baking paper and keep chill in fridge for an hour to set the swiss roll. Serve chilled, drizzled with chocolate sauce. You can make the sponge cake before hand. While beating egg whites, you can add 1/4th tea spoon cream of tar tar or a small pinch of salt, to get full volume. You can add whole Raspberries for extra taste while rolling the cake. 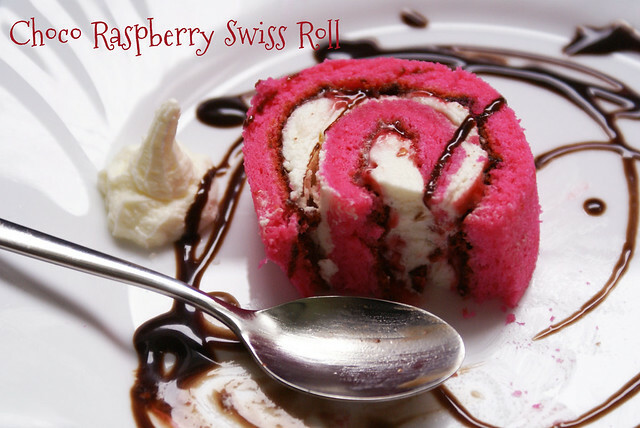 The Swiss roll can be filled with any filling like, chocolate ganache, any type of jam or just the whipped creme. can these look any more gorgeous !!! such pretty pick and rolled to perfection. Wow.. Lovely color and mouthwatering! Thanks Spandana for coming to my space..in turn I found out this wonderful blog! The rolls look just out of some culinary school preparation..perfect and so gorgeous. Beautiful color n a lovely recipe .. These make such a great presentation-really eye catching. You did a great job on the rolling. Thanks for sharing such a delicious and stunning dessert recipe! Those look sinful n picture perfect ~ the color is absolutely amazing!! @Sangeetha… That is so flattering !! @Aipi and Raks… Thank You Girlss.. you make my day!! @Tanu… Love you soooo much!! !